Extreame Savings Item! Save 42% on the DiDaDi Sun Hat with Neck Flap Cover for Men Women, Quick Drying Wide Brim Bonnie Hat Breathable Lightweight UV Protection Cap with Windproof Chin Strap for Hiking Fishing Research Travel Outdoor Golf by DiDaDi at Wander Soul. Hurry! Limited time offer. Offer valid only while supplies last. Quick-Drying & Airy & Soft - High performance wicking fabric actively breathes and wicks sweat away from your skin for cool-wearing comfort. - High performance wicking fabric actively breathes and wicks sweat away from your skin for cool-wearing comfort. - 4 large meshed brass eyelets for ventilation, absorbs sweat enable your head stays cool while working outdoors. - Large brim size : Approx 3.14 inch. - Can effectively shielding the sun protect your neck & face skin from harmful UV damage. - Hat circumference : 21.6-24 inch. - Decorative belt around the cap body, unique magic tap design make it easy to adjust the hat size. - Allows you to adjust the tightness you want. - Can avoid the hat falling down when the wind blowing. - When not in use, the long neck flap of the hat can be hidden to be formed as bucket hat for daily use. - Great gift for women and men. - This hat can be used as a Fishing hat, Sun Protection hat, Gardening hat, Safari hat, Boating hat, Travel hat, Hiking hat, Hunting hat, and Outdoor hat. [ Lightweight & Quick Drying ] - Sun Hat is made of 100% polyester. Soft, quick-drying, lightweight, breathable and comfort wear. The boonie hat is only 0.19lbs, that will make you forget you're even wearing it. Suitable for all-day wear, especially during warm month. [ One Size Fits Most & Adjustable Chin Strap ] - One size fits 21-24 inch head girth with adjustable chin strap for fixing the hat, especially in windy days. And the fastener on the fishing hat is for adjusting the hat circumference to fit your head size. If the size can't fit you, please contact us. [ Wide Brim & Hiding Neck Flap ] - Fishing hat has a large brim (Approx: 3.14inch), which can effectively shielding the sun. The long neck flap of the sun visor can keep neck, ears and face safe from harmful rays. When not use, the neck flap folds up into the brim and held in place by a piece of magic tap as bucket hat for daily use. 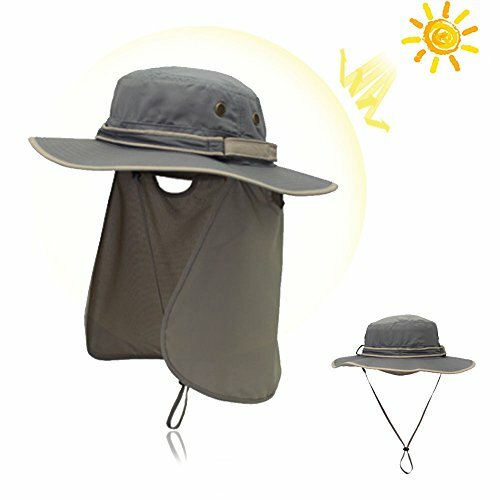 [ Breathable Mesh Hole ] - On the sun hat has 4 meshed brass eyelets for ventilation, let the breeze through very well, enable your head stays cool while working outdoors. [ Perfect for Any Outdoor Activities ] - Unisex sun hat is perfect for fishing, hiking, camping, travelling, hunting, boating, gardening, safari, beach, pool, cookouts or sporting events and working outside for all season use.